What is a license code? License codes are 16-digit alpha numeric codes with 4 sets of 4 digits (XXXX-XXXX-XXXX-XXXX). License codes can be located by clicking on Configure > Licenses (Windows) or Preferences > Licenses (Mac). If you purchased an electronic download and license code, you will receive an e-mail with a link to download the software, as well as the license code for the product. If you purchased a boxed product, your license code will be inside the package on a card labeled "License Code," or on the inside flap of the CD folder. You can find a registration number on the registration card that came with your product, on the bottom of the product box, or on the inside cover, directly underneath the CD in the jacket. Products with current Annual Support and Maintenance (ASM) agreements – Receive licenses for free with ASM fulfillment. Retrospect 15.x for Windows or Retrospect 15.x for Mac purchases between Feb 1, 2019 through March 5, 2019 – Upgrade for free by contacting Customer Support with your license code. Retrospect 12.x/15.x for Windows or Retrospect 14.x/15.x for Mac purchases before Feb 1, 2019 – See the upgrade price for your product using the License Wizard. Bundled OEM products – Bundled OEM versions of the product are excluded from upgrade pricing. I've lost my license. How do I get a replacement license? Replacement licenses are distributed to customers who currently own Retrospect products. If you are not a registered user, you will be required to provide proof of ownership before a replacement license can be issued. To request a replacement license for your software, please contact Customer Support. 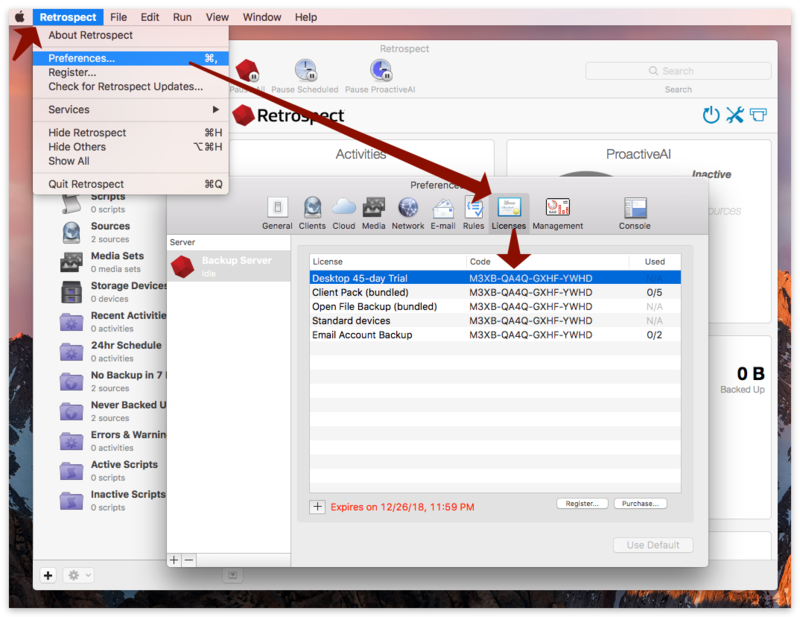 Can I exchange my Retrospect for Macintosh license for a Retrospect for Windows license? You can upgrade your Macintosh product to an equivalent product for Windows. Client packs are cross-platform, for Mac or Windows clients. I have a UAC license code. How do I receive a permanent code? If you receive a Retrospect product upgrade that comes with an upgrade authentication code (UAC), you must complete the following steps to obtain a permanent license code and use your software. Please have both your current Retrospect product license code and UAC ready. Enter your UAC and current license code in the appropriate fields on the Web page. After you complete the process, you will receive your permanent license code via e-mail within 24 hours. If the Web site does not allow you to enter this information, or if you have any questions, please contact the Retrospect Customer Support Team. How do I activate my Competitive Upgrade? Customers who purchase Competitive Upgrades will receive an e-mail with an upgrade authentication code (UAC). To receive a permanent license code and link to download the Retrospect software, please contact Customer Support. If you have questions, please contact Customer Support. Retrospect's License Agreement is grayed out. What do I do? Retrospect will not allow you to accept the Licensing Agreement until after you have scrolled to the bottom of the agreement. Once you are at the bottom, you should see the Accept button become available. I entered my license code into the software, but it is telling me that the code failed. What do I do? If you have copied and pasted the license code into the prompt, it is possible that an extra space was added at the end of your code. Please try typing the license code into the prompt, exactly as it appears in your e-mail or on the license card from the package. If you have tried this already and the code is still not accepted, it is possible you have purchased the wrong product for your computer. Please call the Customer Service department for further assistance. Why won't Retrospect accept my license code? Registration numbers beginning with a capital U, D, F, or J followed by 10 numbers. The corresponding activator codes must be entered. License codes for another copy of the same edition of Retrospect. 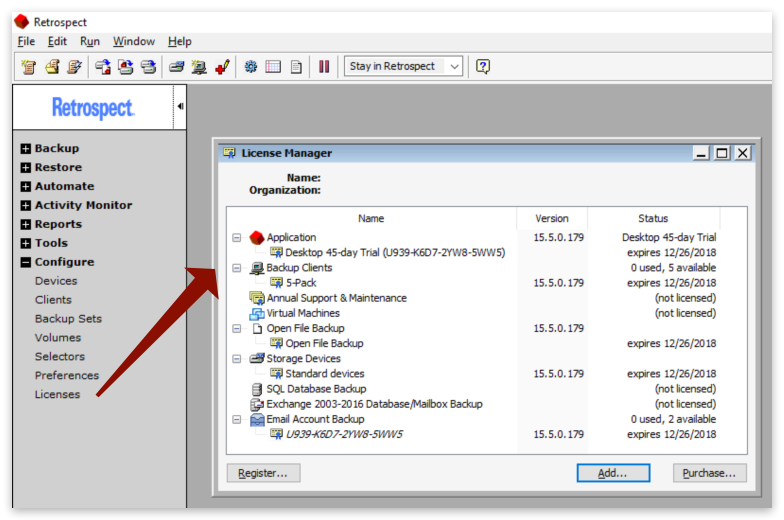 For example, you cannot add a second Retrospect Server Edition code to the License Manager of a Retrospect Server Edition. Still have questions? Please contact Customer Support.